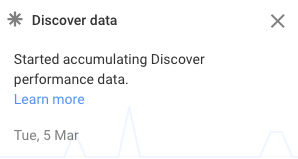 Eoghan O'Sullivan posted on Twitter that spotted a note in the Google Search Console performance report that says "Discover data : started accumulating Discover performance data." The learn more link goes to a page that 404s over here. I am personally not seeing this yet - nor is any of the documentation showing this. But this would be a huge benefit to have and I am excited to see some people are now seeing this filter in the performance report within Google Search Console.